* Zhe Wang and Mingru Zhang contributed equally to this article. Purpose: The chemokine receptor CXCR4 is overexpressed in various types of human cancers. As a specific imaging agent of CXCR4, 68Ga-NOTA-NFB was investigated in this study to assess its safety, biodistribution and dosimetry properties in healthy volunteers, and to preliminarily evaluate its application in glioma patients. Methods: Six healthy volunteers underwent whole-body PET scans at 0, 0.5, 1, 2 and 3 h after 68Ga-NOTA-NFB injection (mean dose, 182.4 ± 3.7 MBq (4.93 ± 0.10 mCi)). For time-activity curve calculations, 1 mL blood samples were obtained at 1, 3, 5, 10, 30, 60, 90, 120, 150 and 180 min after the injection. The estimated radiation doses were calculated by OLINDA/EXM software. Eight patients with glioma were enrolled and underwent both 68Ga-NOTA-NFB and 18F-FDG PET/CT scans before surgery. The expression of CXCR4 on the resected brain tumor tissues was determined by immunohistochemical staining. Results: 68Ga-NOTA-NFB was safe and well tolerated by all subjects. A rapid activity clearance from the blood circulation was observed. The organs with the highest absorbed doses were spleen (193.8 ± 32.5 μSv/MBq) and liver (119.3 ± 25.0 μSv/MBq). The mean effective dose was 25.4 ± 6.1 μSv/MBq. The maximum standardized uptake values (SUVmax) and the maximum target to non-target ratios (T/NTmax) of 68Ga-NOTA-NFB PET/CT in glioma tissues were 4.11 ± 2.90 (range, 0.45-8.21) and 9.21 ± 8.75 (range, 3.66-24.88), respectively, while those of 18F-FDG PET/CT were 7.34 ± 2.90 (range, 3.50-12.27) and 0.86 ± 0.41 (range, 0.35-1.59). The histopathological staining confirmed that CXCR4 was overexpressed on resected tumor tissues with prominent 68Ga-NOTA-NFB uptake. Conclusion: With a favorable radiation dosimetry profile, 68Ga-NOTA-NFB is safe for clinical imaging. Compared to 18F-FDG PET/CT, 68Ga-NOTA-NFB PET/CT is more sensitive in detecting glioma and could have potential in diagnosing and treatment planning for CXCR4 positive patients. CXCR4 is a G-protein coupled chemokine receptor with seven transmembrane domains . By binding its ligand CXCL12, the major physiological role of CXCR4 is to mediate chemotaxis of hematopoietic cells during homeostasis . CXCR4/CXCL12 axis is also involved in the development of the hematopoietic, cardiovascular, and nervous systems during embryogenesis [3, 4]. Relative to normal tissues, CXCR4 is over-expressed in many different types of human cancers, including breast, ovarian, melanoma, prostate, lung, and lymphoma . Recent studies have suggested that high expression of CXCR4 in cancers led to tumor metastasis, aggressiveness, poor prognosis, and resistance to chemotherapy . Consequently, the anti-cancer effect of CXCR4/CXCL12 inhibitors has been extensively investigated in clinical trials . To facilitate drug development and patient screening, it is critical to apply non-invasive imaging to evaluate CXCR4 expression in cancer cells. Several CXCR4 inhibitors or antagonists have been labeled either with 18F, 68Ga or 64Cu for PET imaging including AMD3100, Pentixafor, and T140 [7-11]. T140, a 14-residue peptide possessing disulfide bond, was initially identified as an anti-HIV agent due to its strong binding with CXCR4 . NOTA-NFB was modified from T140 with improved pharmacokinetics, which consists of 14 amino acids, one disulfide bridge between Cys4 and Cys13, and a macrocyclic NOTA chelator for radionuclide labeling . In the precilinical imaging studies, NOTA-NFB displayed highly specific accumulation in CXCR4-positive tumors and high tumor-to-background ratios, suggesting the feasibility of NOTA-NFB for clinical translation for cancer detection. Gliomas are the most common malignant brain tumors, characterized by extensive, diffuse infiltrative growth into the surrounding brain parenchyma and different degrees of neovascularization [14-16]. According to WHO, gliomas are classified to four grades, with grades I-II being low-grade glioma (LGG), and grades III-IV being high-grade glioma (HGG) . However, the diagnostic accuracy of the most commonly used 18F-FDG is confounded by high physiologic glucose metabolism in the brain area, which significantly limits the sensitivity for glioma detection and the specificity for border demarcation . Therefore, more specific radiotracers for PET to assess glioma are highly desirable. Previous studies found that CXCR4 was overexpressed in glioma, especially in malignant glioma [19, 20]. A CXCR4 antagonist labeled with 11C was tested in a C6 rat glioma model with modest tumor/muscle contrast . In this study, for the first time, we labeled NOTA-NFB with 68Ga and applied this tracer for CXCR4 evaluation in glioma patients after measuring the dosimetry of 68Ga-NOTA-NFB in healthy volunteers. NOTA-NFB was synthesized according to a published procedure  using NOTA-NHS ester (CheMatech) as a chelator. 68Ga-NOTA-NFB (Figure 1) was synthesized by the following protocol: 50 μg of NOTA-NFB (5 μg/μL in deionized water) was added into a mixture of 50 μL of sodium acetate solution (1.25 M) and 1 mL of 68GaCl3 eluent (370-666 MBq, pH 1.3-1.5) obtained from a 68Ge/68Ga generator (ITG Co., Germany). The mixture was then heated at 100 ºC for 10 min. The reaction mixture was quenched by adding 10 mL of water and was then loaded onto a pre-activated C-18 Sep-pak Plus cartridge (500 mg, Waters). The cartridge was washed with an additional 6 mL of water. The radiolabeled peptide was eluted with 1 mL of 10 mM HCl/ethanol. The resulting solution was analyzed by instant thin-layer chromatography (ITLC, Bioscan, USA) and HPLC (Agilent Technologies 1200, USA). ITLC was performed with silica-gel paper strips (VARIAN) in a 1:1 mixture of methanol and sodium acetate developing solution. Analytical HPLC was performed on an Agilent Technologies 1200 system equipped with a RP C-18 column (ZORBAX, 5 µm, 4.6 × 250 mm). The HPLC method: solvent A consisted of 0.05% trifluoroacetic acid (TFA) in water, and Solvent B consisted of 0.05% TFA in acetonitrile with a flow rate of 1 mL/min. Gradient: 0-3 min, 5-5% solvent B; 3-20 min, 5-65% solvent B. The final 68Ga-NOTA-NFB solution was filtered with a 0.22 μm Millex-GP filter (EMD Millipore) before the injection. This study (ClinicalTrials.gov identifier: NCT02327442) was approved by the Independent Ethics Committee of Xijing Hospital and written informed consent was obtained from all the subjects. Six healthy volunteers (3 F, 3 M; mean age 48 ± 11 y; age range, 37-61 y) were recruited based on their medical history, physical examination, electrocardiogram, urinalysis, and standard blood tests. Eight newly diagnosed glioma patients (6 F, 2 M; mean age 52 ± 13 y; age range, 30-73 y; 2 LGG and 6 HGG were confirmed by pathological analysis after surgery) were included based on their clinical symptoms and magnetic resonance imaging (MRI). The exclusion criteria were pregnancy, lactation, hepatic and renal insufficiency and inability to complete the needed examinations. The demographic characteristics of the healthy volunteers and glioma patients were listed in Tables 1 and 2, respectively. 68Ga-NOTA-NFB in the range of 4.76-5.04 mCi (176.12-186.48 MBq) was injected to the healthy subjects within 30 seconds. The PET scans were acquired at 0, 30, 60, 120 and 180 min after tracer injection using a Biogragh 40 system (Siemens Medical Solutions, Erlangen, Germany), with seven bed positions (2 min/bed, from head to the proximal thighs). Low-dose CT scans for attenuation correction were acquired (automatic mAs, 120 keV, 512 × 512 matrix, 5 mm slice thickness, 1.0 s rotation time, and 0.8 pitch). PET scans were acquired for 2 min/bed. The imaging field ranged from head to the proximal thighs. The PET/CT images were transferred to a multimodal workstation (Syngo TrueX and HD Truepoint Siemens Medical Solutions) for data analysis. Regions of interest (ROIs) were outlined over the major organs based on the contour of CT images. For the bone marrow dose calculation, we used the image-based method and chose the lumbar vertebrae L2-L4 to outline the ROI. SUVmax of the major organs were obtained from the corresponding PET images, then according to the function, organ activities at different time points were calculated. Time-activity curves were integrated using the GraphPad Prism software (version 5, GraphPad Software, Inc., USA). The individual normalized number of disintegrations were used for calculating effective doses for the standard 70-kg adult male model with OLINDA/EXM (Version 1.1, Vanderbilt University, 2007) for each patient separately [22, 23]. 1 mL blood samples were obtained at 1, 3, 5, 10, 30, 60, 90, 120, 150 and 180 min after tracer injection. After centrifugation, the radioactivity in red blood cells and plasma was measured with a Gamma counter. Vital signs (heart rate, pulse oximetry value, body temperature, and blood pressure) were monitored every 15 min to ensure the safety of the subjects. All eight patients underwent both 68Ga-NOTA-NFB and 18F-FDG PET/CT scans. For each patient, 1.48-2.96 MBq (0.04-0.08 mCi) per kilogram of 68Ga-NOTA-NFB was injected intravenously. Head CT scans for attenuation correction were acquired (200 mAs,120 keV, 512 × 512 matrix, 3 mm slice thickness, 1.0 s/rotation, and 0.8 pitch), followed by brain PET acquisition at 40 min post-injection of 68Ga-NOTA-NFB (1 bed position, 10 min duration). 18F-FDG PET/CT was acquired for each patient within 3 days of 68Ga-NOTA-NFB scan. Patients fasted for at least 4 h before the 18F-FDG was injected at a dosage of 0.15 mCi per kilogram of body weight. PET/CT images were independently reviewed by 3 experienced nuclear medicine physicians. Resected tissues from all eight patients were sliced, followed by immunohistochemical staining to evaluate the expression of CXCR4. Briefly, 5-μm-thick tissue sections from all primary tumors were stained for the CXCR4 protein using a primary rabbit polyclonal antibody (Abcam, clone 2074; Cambridge, UK). Slides were deparaffinized through a series of xylene baths. Then rehydration was performed through graded alcohols. The sections were then immersed in methanol containing 0.3% hydrogen peroxide for 20 min to block endogenous peroxidase activity and incubated in 2.5% blocking serum to reduce nonspecific binding. Sections were subsequently incubated overnight at 4 °C with primary anti-CXCR4 antibody at dilutions of 1:1000. Detection of the primary antibody was performed by incubation with peroxidase-conjugated affinipure goat anti-rabbit IgG (ZB-2301, ZSGB-BIO, Beijing). As a chromogen, 3,3'-diaminobenzidine (DAB) was used. Sections were rinsed, counterstained with hematoxylin (Sigma-Aldrich Inc.) . After washing, coverslips were mounted and sections were examined under an Olympus DP72 microscope. The difference test of SUVmax and T/NTmax between 68Ga-NOTA-NFB PET/CT and 18F-FDG PET/CT was through paired t-test. All the statistical analyses were performed by GraphPad Prism software (version 5, GraphPad Software, Inc., USA), and p < 0.05 was considered statistically significant. The decay-corrected radio chemical yield (RCY) of 68Ga-NOTA-NFB was 74 ± 3 % (n = 5) and the radiochemical purity (RCP) tested by HPLC was nearly 100%. The weights of six healthy volunteers were 57 ± 8 kg (range, 48-67 kg) and the average injection dose of 68Ga-NOTA-NFB was 4.93 ± 0.10 mCi (range, 4.76-5.04 mCi) (Table 1), with the mean specific radioactivity level of 7.4-9.9 MBq/nmol. As such, the mean mass of tracer injected to each subject was 21-64 nmol or 16.7-50 µg. The administration of 68Ga-NOTA-NFB was safe and well tolerated. No significant changes in vital signs, electrocardiograms, or clinical laboratory blood tests were observed during the imaging period. 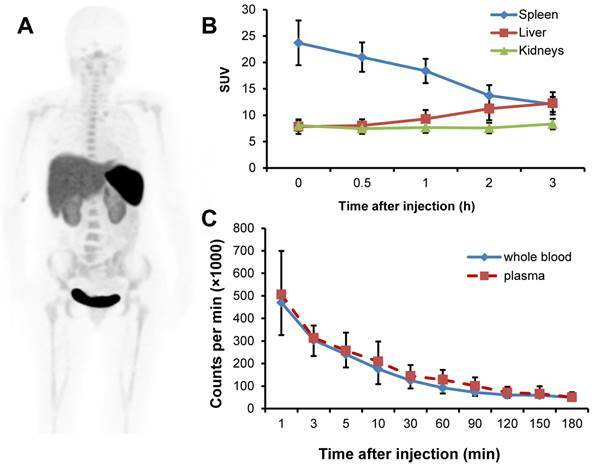 The radioactivity was accumulated predominantly in the spleen and urinary bladder at 1 h after injection, followed by liver, kidneys and the red marrow (Fig. 2A). The activity in the spleen decreased quickly over time. The initial uptakes in the liver and kidneys were moderate, which increased over time, while that in the kidneys remained virtually unchanged (Fig. 2B). There was a rapid clearance of the activity from the blood circulation (Fig. 2C). Based on the time-activity curves for 68Ga-NOTA-NFB in the blood samples, majority of the tracer was found in the plasma with negligible accumulation in the red blood cells. A, PET image of distribution of 68Ga-NOTA-NFB 1 h after injection in a healthy volunteer (subject 3). The uptake is mainly in the spleen, liver, kidneys and urinary bladder. B, Decay corrected averaged time-activity curves of 68Ga-NOTA-NFB in the liver, kidneys and spleen for all healthy volunteers. Error bars indicate standard deviations (n = 6). C, Decay corrected averaged time-activity curves for 68Ga-NOTA-NFB in the whole blood and plasma determined by gamma counter. Error bars indicate standard deviations (n = 6). The mean normalized number of disintegrations in units of hours of the source organs and remainder of the body are listed in Table 3. The largest mean normalized number of disintegrations for the subjects was found in the remainder tissues (0.47 ± 0.12 MBq-h/MBq), followed by muscle (0.37 ± 0.04 MBq-h/MBq) and liver (0.34 ± 0.34 MBq-h/MBq). The absorbed doses of various tissues were shown in Table 4. The organ with the highest absorbed dose was spleen (193.8 ± 32.5 µSv/MBq), followed by liver (119.3 ± 25.0 µSv/MBq), kidneys (84.9 ± 9.4 µSv/MBq) and adrenals (55.2 ± 15.7 µSv/MBq). On the other hand, brain absorbed very low dose (2.7 ± 0.6 µSv/MBq), suggesting that 68Ga-NOTA-NFB does not readily cross intact blood-brain barrier (BBB). The mean effective dose was 25.4 ± 6.1 µSv/MBq. There was barely any uptake of 68Ga-NOTA-NFB in normal brain tissues, including the white matter and the cortical gray matter, with the rather low SUVmax of 0.11 ± 0.02 (range, 0.10-0.13). In contrast, 18F-FDG metabolizes actively in normal brain tissues, resulting in a high background with SUVmax of 9.63 ± 2.97 (range, 6.22-15.33). In the glioma patients, specific accumulation of 68Ga-NOTA-NFB was observed with the SUVmax of 4.11 ± 2.90 (range, 0.45-8.21) (Table 5), which was significantly different from that of 18F-FDG (p < 0.05), with the SUVmax of 7.34 ± 2.90 (range, 3.50-12.27). As a result, the T/NTmax of 68Ga-NOTA-NFB (9.21± 8.75, range: 3.7-24.9) was significantly higher than that of 18F-FDG (0.86 ± 0.41, range: 0.35-1.59) (p < 0.05), indicating that 68Ga-NOTA-NFB is superior to 18F-FDG in determining the boundary of glioma. Furthermore, we found that the SUVmax and T/NTmax of 68Ga-NOTA-NFB in HGG were much higher than those in LGG, with the SUVmax and T/NTmax for 6 HGG being 5.32 ± 2.19 (range, 2.55-8.21) and 11.34 ± 9.26 (range, 3.66-24.88), respectively, while for 2 the LGG patinets, the SUVmax were 0.45 and 0.54, and the T/NTmax were 2.7 and 3.0. *The p value of SUVmax between 68Ga-NOTA-NFB and 18F-FDG. †The p value of T/NTmax between 68Ga-NOTA-NFB and 18F-FDG. 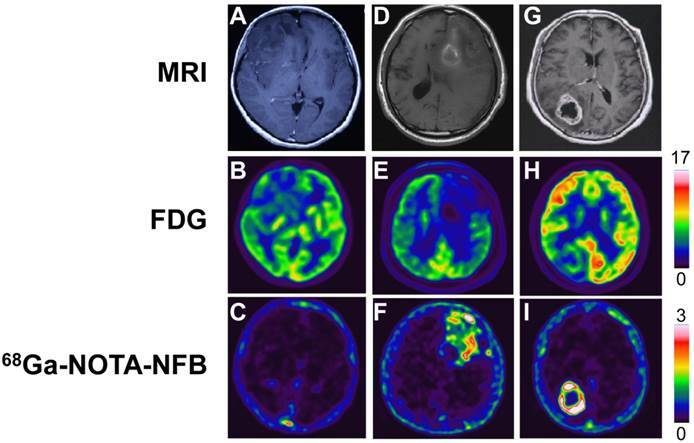 Comparison of MRI, 18F-FDG PET and 68Ga-NOTA-NFB PET in three different glioma patients. In the upper row, A & G are enhanced MRI by administration of gadolinium contrast agent and D is MRI without contrast enhancement. The middle row shows 18F-FDG PET and the lower row shows 68Ga-NOTA-NFB PET. The first column (A, B & C): Patient No. 2, F, 30 y, grade II; the second column (D, E & F): Patient No. 3, M, 61 y, grade III; the third column (G, H & I): Patient No. 4, F, 60 y, grade IV. Hematoxylin-eosin (H&E) and immunohistochemical stains of glioma samples. Upper row (A, C & E): hematoxylin-eosin stains, magnification 400×; lower row (B, D & F): immunohistochemical stains of CXCR4, magnification 400×. The first column (A & B): F, 30 y, grade II; the second column (C & D): M, 61 y, grade III; the third column (E & F): F, 60 y, grade IV. Hematoxylin-eosin (H&E) and the immunohistochemical staining for CXCR4 were performed in glioma tissues from all 8 patients. Two tumors were graded as WHO II, 1 tumor as WHO III and 5 tumors as WHO IV respectively, according to the H&E staining. For all 8 tumors, the expression of CXCR4 in the resected glioma tissues was confirmed to be positive. The expression of CXCR4 varies from different pathological grades, with low expression for grade II, and high for grade III-IV (Fig. 4), which corroborates with the SUVmax of 68Ga-NOTA-NFB PET. CXCR4 is overexpressed in more than 23 human cancers . It is involved in three fundamental aspects of cancers: primary tumor growth, cancer cell migration, and establishment of metastatic sites; and therefore, it can be considered as an ideal target for imaging . Many peptidic and small molecular ligands with different modes of antagonistic activity have been developed so far, among which, NOTA-NFB is a specific inhibitor of CXCR4 receptor and has been previously labeled with 64Cu for imaging tumor CXCR4 expression . In this investigation, we first assessed the biodistrubtion and dosimetric properties of 68Ga-NOTA-NFB and then evaluated its potential for glioma diagnosis. 68Ga-NOTA-NFB had prominent uptake in the liver and spleen. The high uptake in the spleen can be explained by its high physiological expression of CXCR4, and also this result is in line with the imaging study of CXCR4 in mice [7, 8]. However, CXCR4 expression in the liver is limited to hematopoietic cells and stellate cells. The high uptake of this tracer in the liver may be due to the presence of metal chelators, which may undergo transchelation under physiological condition. High accumulation of 68Ga-NOTA-NFB was also detected in the kidneys and the urinary bladder, possibly due to the hydrophilicity and relatively small size of the peptide. The rapid blood clearance may commonly be due to the fast renal excretion of peptide tracers. The effective dose of 68Ga-NOTA-NFB reported here (25.4 μSv/MBq) is comparable to those of 68Ga-DOTA-TOC (23 μSv/MBq), 68Ga-DOTA-NOC (25 μSv/MBq), and 68Ga-NOTA-RGD (22 μSv/MBq) . With an injected dose of 5 mCi (185 MBq), the subject would be exposed to an effective radiation dose of 4.70 mSv. This dose is a little bit higher than another recently reported CXCR4 targeting agent, 68Ga-pentixafor [11, 26, 27]. However, it is much lower than the dose limit of 0.5 Sv per year, as set forth by the Food and Drug Administration . According to the calculated dosimetric values (spleen demonstrated the highest absorbed dose, 193.8 μSv/MBq), a maximum of 70 mCi (2.58 GBq) of 68Ga-NOTA-NFB per patient can be injected per year, or up to 14 acquisitions can be performed in one patient per year by 5 mCi (185 MBq) per scan. This supports the use of 68Ga-NOTA-NFB in repeated PET scans, for example, in therapeutic monitoring. 18F-FDG, the most commonly used PET tracer in the nuclear medicine clinic, has been extensively investigated in the diagnosis of various human cancers and cardiovascular diseases. However, the application in brain tumors is limited due to the high normal brain background, resulting from the vigorous glucose metabolism of the brain. Thus, an effective imaging agent with high accumulation in the tumor and low background in the normal brain is desirable. Glioma is the most common primary brain tumor and accounts for nearly half of all brain tumors . Recently, numerous studies have reported that chemokine receptor CXCR4 was overexpressed in glioma and could be a target for glioma diagnosis. To the best of our knowledge, this is the first PET imaging study conducted in humans to visualize CXCR4 expression for preoperative, noninvasive measurement of glioma. 68Ga-NOTA-NFB specifically accumulated in glioma and was vacant in normal brain tissues. On the contrary, 18F-FDG showed less accumulation in glioma than the normal brain tissues. Compared to 18F-FDG PET/CT, the favorable SUVmax and high T/NTmax of 68Ga-NOTA-NFB PET/CT could improve the sensitivity of glioma diagnosis. Lately, 68Ga-NOTA-PRGD2 was applied to detect glioma by targeting integrin αvβ3 . 68Ga-NOTA-PRGD2 was found to have high accumulation in the glioma, and low uptakes in the normal brain except for the choroid plexus. Compared to the significant accumulation of 68Ga-NOTA-PRGD2 in choroid plexus, 68Ga-NOTA-NFB was absent in that area, which enable it to diagnose cerebroventricular neoplasms. The information obtained from the histopathological staining confirmed that CXCR4 was overexpressed on glioma, and was consistent with the SUVmax of 68Ga-NOTA-NFB, indicating that CXCR4 could be a target in evaluating glioma. We also noticed that the CXCR4 expression and SUVmax of 68Ga-NOTA-NFB in HGG was much higher than that of LGG, suggesting that 68Ga-NOTA-NFB may be capable of evaluating glioma grades. However, due to the limited number of recruited patients, especially LGG, we are unable to correlate the CXCR4 expression with glioma grades in this study. 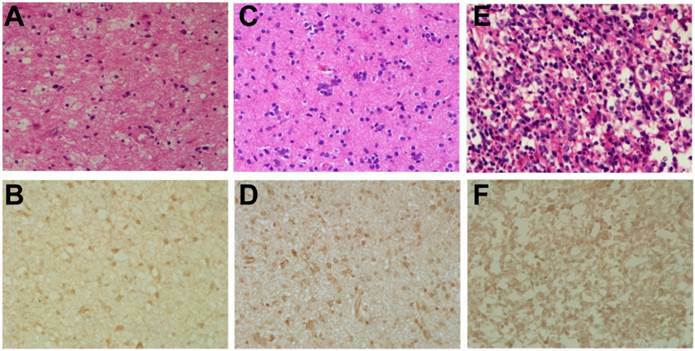 Further investigations with larger number and various grades of glioma patients are necessary to evaluate the full potential of 68Ga-NOTA-NFB in glioma diagnosis and prognosis. With a favorable radiation dosimetry profile, 68Ga-NOTA-NFB is safe for clinical imaging. The specific accumulation of 68Ga-NOTA-NFB in glioma and the clean background in normal brain tissue suggest that 68Ga-NOTA-NFB may be a valuable tracer in diagnosing and evaluating golima patients. This work was supported by the Key Program of National Natural Science Foundation of China (Grant No. 81230033), the Major State Basic Research Development Program (Grant No. 2011CB707704), the Major Instrument of National Natural Science Foundation Research Project (Grant No. 81227901), the National Natural Science Foundation of China (Grant No. 81371594, 81401442, 81371596), the International Cooperation Program of Xijing Hospital (Grant No. XJZT13G02), a Key Science and Technology Program of Shaanxi Province, China (Grant No. 2013K12-03-05). The authors are grateful to Zhiyong Quan, Zhiping Yang, Jin Zeng, Mingxuan Zhao, and Ming Zhang at the Department of Nuclear Medicine, Xijing Hospital, for performing the PET/CT scans and collecting data. We also thank Yi Li from the Department of Neurosurgery, Tangdu Hospital, for immunohistochemical analysis, and Jing Li, from the Department of Pathology, Xijing Hospital, for pathological analysis.